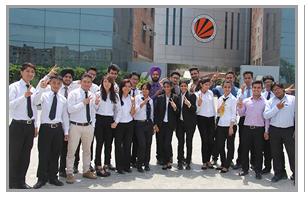 LPU students of the School of Hotel Management and Tourism have got 100% placement with prestigious global establishments this year. LPU students of the year 2015 passing out batch have been placed at allowances/salary up to Rs 22.5 Lakh per annum. Their employers are top hotel, resorts, palaces’ groups and airways including ‘Ritz-Carlton’ (USA), Qatar Airways (Doha), Oberoi Group, Zuri, Grand Hyatt, Hyatt, Sarovar, Bercos and more. Many of them have already joined their duties in top countries and Indian Cities at coveted posts. M Sc Hotel Management student Anish Vikas Diwikar has been selected by world’s Top Hotel Company ‘Ritz-Carlton’ (USA) at Rs 22.5 Lakh allowances per annum. As a seasoned Chef, Anish was trained at LPU for preparing Thai, Mexican & Italian foods in addition to varied sea-food preparations for beach tourists. Another student Karan Sharma of B Sc Airlines, Tourism & Hospitality Management has been selected on Rs 18 Lakh salary per annum by Qatar Airways as Cabin Crew. Other prestigious recruiters of LPU students are Ananda Spa, ITC Fortune, Leonia Holistic, Air Vistara, JET Airways, Spice-jet, Indigo airlines and more. Everyone loves to visit new destinations to spend their vacation in most beautiful land. When planning for a trip, you need to give more importance to travel and accommodations. Kanyakumari is best destination o visit in India. Hotels in Kanyakumari make your trip memorable. Very interesting to read. Thanks for sharing.